You may specify a large wipe and clean task, which may include wiping free disk space, cleaning your computer from any internet and document links, and one or several wipe lists. • On the Main panel, click the Wipe & Clean Tasks button . The R-Wipe & Clean Tasks Pane Quick Reference panel will appear. 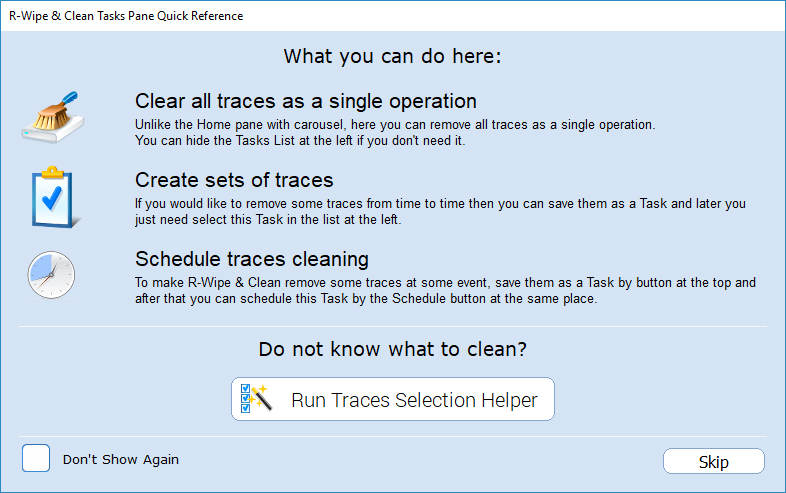 You may either use Traces Selection Helper to quickly select some most common traces to include into the task, or skip it to manually specify the items to clean. If you disable this panel, you may later enable it on the General Settings tab of the Settings panel. If you want to just free up disk space then it's enough to check this item. R-Wipe & Clean will remove all traces stored as various files (cache files, logs, temporary files, memory dumps, etc). However, all traces stored in the Registry or in configuration files of various format will be left intact! Select these traces if you worked online with some web browser or Skype. Your personalized settings for webpages (cookies, saved passwords, etc) will be left intact! You can remove such traces by selecting root item of the corresponding web browser or Skype on the Navigation tree. 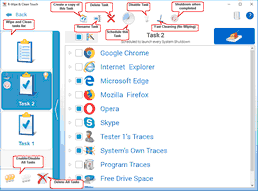 In addition to web browsers and Skype, there are various applications that use Internet and keep web traces but such traces aren't to be removed here. 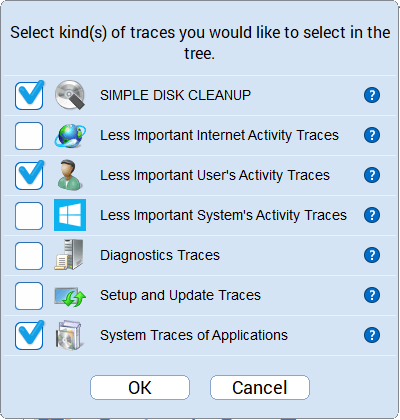 By selecting these traces, you can remove commonly created traces for the current user even if you do nothing on this PC. This will also remove the traces created by system components used in the applications. For example, traces left after using Open and/or Save dialogs in some applications. 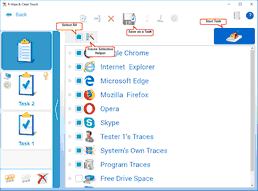 Here you can remove the traces created by the system even if you do nothing on this PC. Administrative rights are required for removing these traces! Here you can remove traces created after errors in applications or system (error reports, dump files, etc). Many applications can create such traces without notifying you. Removing these traces will free some space on the drive but can make it difficult to troubleshoot error issues. 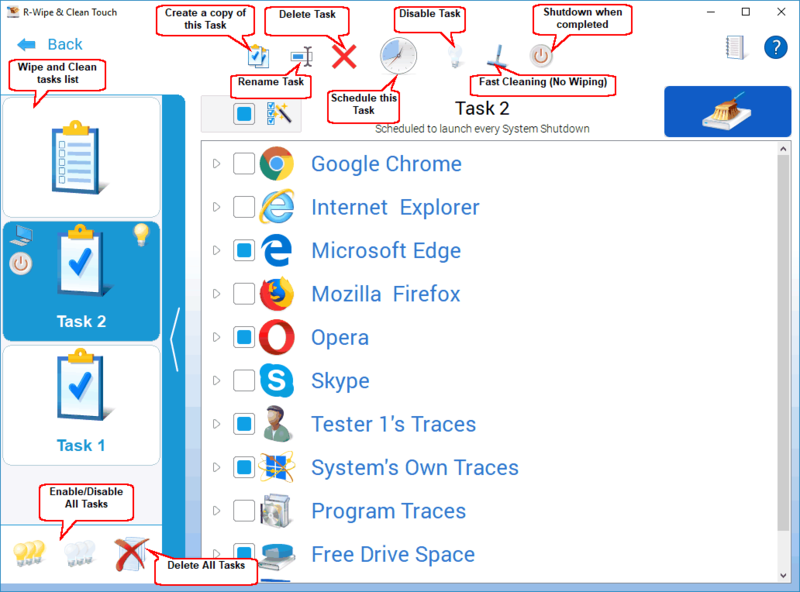 Here you can remove traces created after installation your system, as well as after each of its updates. Removing these traces can free large amount of disk space but can make it difficult to troubleshoot installation issues. It's recommended to remove such traces after a Windows Update installation. Here you can remove the traces that can be left in the system after removing various applications. It's recommended to remove such traces after removing large applications that were installed via installer. • Select the traces you want to clean and tap the Start Task button. When R-Wipe & Clean finishes wiping and cleaning, the Report dialog box will appear showing cleaning results. You may save the task to run in future, either manually or using the the Scheduler . • Tap the Save as a Task button. The existing tasks appear in the Wipe and Clean tasks list. You may modify/delete/schedule an existing task when it's selected. Click this button to toggle task activation/deactivation. A disabled task won't be started by the scheduler, but it can be run manually. Enable this option to run the task faster. When this option is enabled, all files will be deleted rather than wiped regardless of Files Wiping Settings settings. Enable this option to shutdown you computer when the task has been completed. • Select the task and then tap the Start Task button. R-Wipe & Clean will start cleaning the computer, and the Deleting and wiping dialog box will appear showing the cleaning progress. When R-Wipe & Clean finishes wiping and cleaning, the Report dialog box will appear showing cleaning results. • Select the required task. • Make the necessary changes. They will be saved automatically. • Select Disable/Enable All Tasks on the Tasks panel. • Select Delete All Tasks on the Task panel. • Select the required task and tap the Copy Task button on the Task panel.